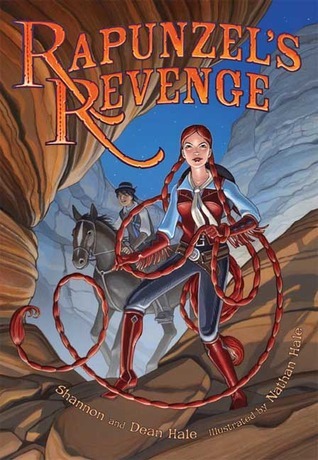 Rapunzel’s Revenge is a graphic novel that was recommended to me by my 10-year-old son and my (then) 8-year-old daughter. My son read it first, then passed it to his sister, they passed it to me and I have now passed it on to my husband. Rapunzel’s Revenge is a “fractured fairy tale” version of the traditional Rapunzel story. In the Hales’ version Rapunzel is initially unaware that her pampered lifestyle in huge (albeit somewhat lonely) villa and grounds with her Mother Gothel, guards and servants is due to her “mother’s” dominance over the surrounding lands. In fact she is unaware there are surrounding lands until the day she climbs the wall in the garden–explicitly against Mother Gothel’s wishes. Once outside the wall Rapunzel is aghast at the vast lands, buildings and people on the other side. And before Mother Gothel’s guards can return her to the other side of the wall, Rapunzel gets a drink of water from a woman she discovers is her real mother. This woman tells how Mother Gothel took Rapunzel from her parents,killed her father and forced her mother to work in the mines. Mother Gothel has always told Rapunzel that she was her mother. Angered by this new information Rapunzel confronts Mother Gothel, who then imprisons her in a tower in the woods. Mother Gothel’s plan is to keep Rapunzel isolated until she learns to capitulate to her will. Just as in the original story this tactic does not work. Unlike the original story Rapunzel finds a way to escape from her tower on her own. She then sets out to rescue her mother and with a vague idea that she will teach Mother Gothel a lesson about the cruelty and selfishness of mistreating others. Along the way Rapunzel meets Jack (think beanstalk) and the two develop a friendship that grows throughout their adventures. Together they encounter Wild-West-style villains and frightening beasts from crazed wolves to a giant sea serpent. Through it all Rapunzel’s braids figure prominently in roping, tying and whipping up on a storm of bad guys. A satisfying good-versus-evil conclusion does not disappoint! This husband and wife team has definitely become one of my favorite author teams–graphic or traditional novels. Rapunzel’s Revenge is one of those rare graphic novels with sophisticated plotting at an upper elementary/middle school comprehension level without any age-inappropriate content. Its appeal is universal in both theme and humor. Nathan Hale’s (no relation) illustrations are an exquisite complement to the text. They are rich and bold in the earth tone colors of the Wild West and are as equally magnetic to the reader as the story itself. So…is it still hard sometimes to think about what Mother Gothel did to you? RAPUNZEL: I called her Mother for most of my life, and all the while she had my real mother in her slave mines. JACK: No, no, not that. I meant how she, you know, named you after lettuce. The next panel show Rapunzel punching Jack in the shoulder and an “Ow” bubble over his head. Calamity Jack is a stunningly good sequel to Rapunzel’s Revenge. It is another funny, fast-paced adventure with a fairytale twist. In this book we first get Jack’s backstory (which is only hinted at in Rapunzel’s Revenge). We find out why Jack had to flee the city, which ultimately led to his encountering Rapunzel in the first book. In this version of Jack and the Beanstalk our Jack buys the magic beans by pawning his most precious possession–his dead father’s coat. He uses the beans as part of an elaborate plan to rob the giant Blunderboar. The plan goes horribly wrong; as Jack escapes from Blunderboar’s penthouse he is followed by one of the giant’s lieutenants. when he follows Jack down the beanstalk he ends up falling to his death. Jack races back to the tenement where he lives with his mother in their ground floor bakery. He finds disaster due to a bean mistakenly thrown away: another beanstalk has sprouted and is causing the destruction of the entire building. Although Jack ensures everyone gets out of the tenement safely, Blunderboar swears revenge against Jack for giantcide and Jack’s mother tells him she is ashamed of him and he should leave. Jack rides the train out of the city into the Wild West and meets Rapunzel. With Rapunzel Jack discovers a better part of himself and succeeds in gaining a reward which he wants to use to rebuild his mother’s home and business. The story jumps back to the present as Jack returns to the city accompanied by Rapunzel, intending to right his past wrongs. But things in the city are much worse than when Jack left. The people are besieged by the “Ant People,” a terrifyingly gigantic race of ants that walk upright like humans. Blunderboar–the same giant who had sworn revenge on Jack–is now running the city, using his giant forces to battle the Ant People for the citizens. 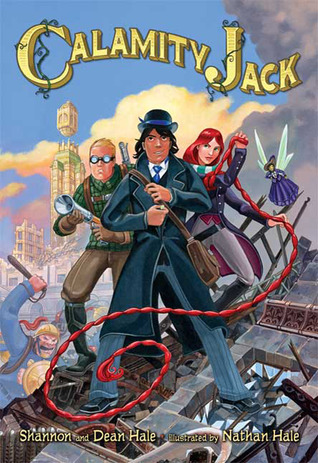 Jack and Rapunzel team up with a young newspaperman–of whom Jack becomes jealous when he sees him with Rapunzel–who is speaking out against Blunderboar. Jack finds out that Blunderboar is holding his mother prisoner in his fortress, using her to bake bread with a gruesome ingredient. Anxious to rescue his mother and terrified Rapunzel will discover the truth about his past illegal activities the trio nonetheless uncover the fact Blunderboar is not the savior he claims to be. They plan to expose him to the citizens and set things right in the city. Again we have a nail-biting climax to a fast-paced, funny adventure. This conclusion even includes a dual admission of love–again, enough to make young readers role their eyes and yet have every reader anxious for the next installment. Neither of these books make a wrong step. These are books for fans of graphic novels, fairy tales, humor, the “buddy” dynamic or just a really good story with phenomenal illustrations. Pick one (or both) up and get ready for fun, adventure, danger and humor!